U.S., Russia, Security Council Get A Share Of Blame For Syrian Violence In New Report : The Two-Way The report from 30 aid and human rights groups faults the U.N. Security Council for its approach to Syria, while also giving credit to current peace efforts. 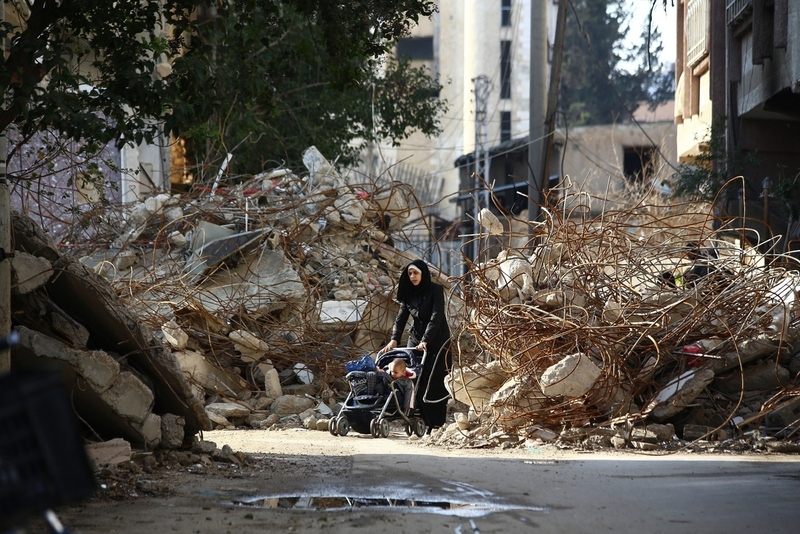 A woman navigates a stroller between the rubble of destroyed buildings in the rebel bastion of Douma, Syria, in December 2014. A new report card on the international response to Syria's violence faults the U.N. Security Council. 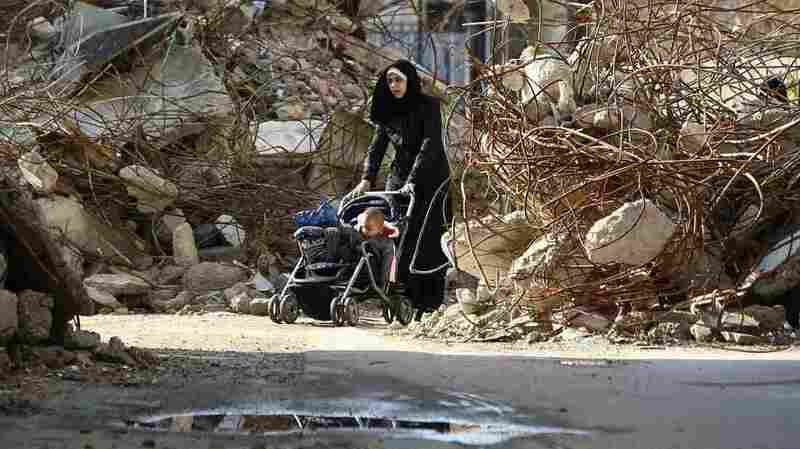 The fifth year of the Syrian conflict was the worst yet for civilians — and Russia, the U.S., France and Britain are partly to blame. That's according to a new report from 30 aid and human rights groups, including Oxfam and Care International. Titled "Fuelling the Fire," the report says some 50,000 people have been killed since April 2014 and that nearly a million more have been forced to flee their homes. It also says that as permanent members of the U.N. Security Council, the U.S., Britain, France and Russia could be doing much more to end the bloodshed. While fixing most of the blame on the Syrian regime and armed opposition groups, as well as violent extremists such as the Islamic State, the report says major world powers are undermining their own calls for peace through the weapons they provide to combatants, their own military strikes and what the report calls inadequate pressure on their allies to stop the killing. Russia comes in for blame for its deadly air campaign, and for failing to stop its Syrian ally from using sieges and starvation as weapons of war. Jan Egeland with the Norwegian Refugee Council, one of the groups behind the report, said this week in Geneva that despite recent progress in aiding besieged areas, there are still seven places where they can't get aid to trapped people. "It's very clear that the seven areas where we have not reached, are [controlled] — six by the government, one by Islamic State," he said. "The two areas [controlled] by armed opposition groups in the north and Idlib, we have been able to service those." Reason for hope did appear on the horizon just as this report was being finalized. A fragile cease-fire has allowed aid to reach some besieged areas in Syria, and problematic peace talks could resume in Geneva as early as Monday. The authors of the report acknowledge that Russia and the U.S. in particular deserve credit for this progress, but they add that the "tremendous test" they now face is to get their allies to keep their guns quiet while diplomats strive for a more enduring cessation of hostilities.